Devote yourself to unselfish religious deeds? Become a better person so that God will accept you? You may be surprised that none of those things will work. However, through the Bible, God has made it clear how we can know Him. 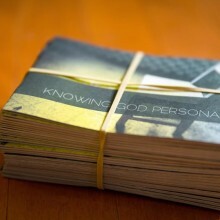 Four principles, presented in your language (choose from 150), explain how you can begin to know God personally through His son Jesus. The interactive presentation below is available in multiple languages by clicking the drop down menu in the top right corner. Additionally, this material is available in the God Tools App or as a web app here.